The PlayStation Network is seeing the release of yet another Mega Man classic: Mega Man 3, err, I mean, Rockman 3! Next week, March 8th, PlayStation 3 owners can download the Complete Works version of Rockman 3 for $5.99 or $3.00 if you're a PlayStation Plus member. 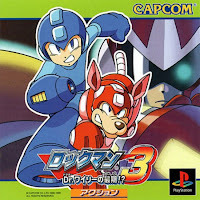 As with past PSN Complete Works games, Rockman 3 will support cross platform play with both PS3 and PSP systems. Do bear in mind, you're purchasing an untranslated version of Rockman 3 -- an enhanced port, to be exact, originally released way back in the late nineties in Japan. Being an import PSone classic, menus and other extras will retain their original Japanese text. Nevertheless, little no know Japanese is required to enjoy the main game itself. And hey, with Mega Man 3 coming our way, it's only a matter of time before Rockman 4 jumps the pond! Hopefully we'll get that one sooner rather than later... preferably, the following week. Ah, yes, my favorite game in the entire series. But my top priorities are the rest of the classics and X on the VC. Come on, Capcom! YAY. After 3 and 4 are released I wonder if 5 & 6 will be released since They have never have been available on a download service before. Nice. I was wondering when they were going to come around with this one. I still have no idea why they didn't bother translating either of the Complete Works titles before releasing them on the Playstation Store, but...whatever. On a side note, I find it kind of odd how they didn't bother to compose remixed tracks for Mega Man 1-3, like they did for the next three games. It's kind of a shame, really, since Mega Man 3 has such an exceptionally good soundtrack and everything. When they get to Megaman 8, I'm going to be the happiest camper that has ever camped in these woods. I thought they did composed remixes for 2 - 6 of the PSN ports. I've listened to 2's and 3's remixes on youtube. It's just 4's - 6's are easier to find. Are you sure those didn't come from the Arcade titles? I've seen lots of people on Youtube pass those off as "Complete Works" remixes, even though they clearly came from Power Battle and Power Fighters. If PSN gets Complete Works 5 & 6 before Wii's virtual console gets the NES versions, asses will most definitely need to be kicked. All of the Complete works games have remixed music. The first few borrowed heavily from the two Rockman arcade games(CPS2 versions), as Krazy Monkey took note of. However, original rearrangements also started with Rockman, such as a new version of the Mega Man 3 password song, and then a new title theme arrangement for Rockman 3. The weird thing about this, is that they replaced other songs with filler arcade stage music(Wily 1 from MM 1 was replaced, for example). I have the Capcom Game Book version, too, so I know from experience.